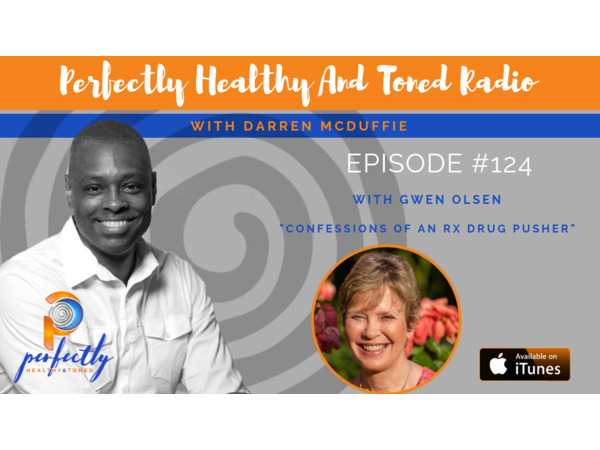 Gwen Olsen author of,"Confessions Of An Rx Drug Pusher" visits Perfectly Healthy And Toned Radio. Gwen Olsen spent fifteen years as a sales rep in the pharmaceutical industry working for health care giants including Johnson & Johnson, Syntex Labs, Bristol-Myers Squibb, Abbott Laboratories and Forest Laboratories. As a mental health activist, Gwen has testified before the Food and Drug Administration’s Psycho-pharmacology committee, as well as many legislative committees, and has led rallies and marches in protest against psychiatric abuse. Gwen’s message is a call to action and a plea for each of us to step up and do our part to help create a medical system that serves all and does harm to none!